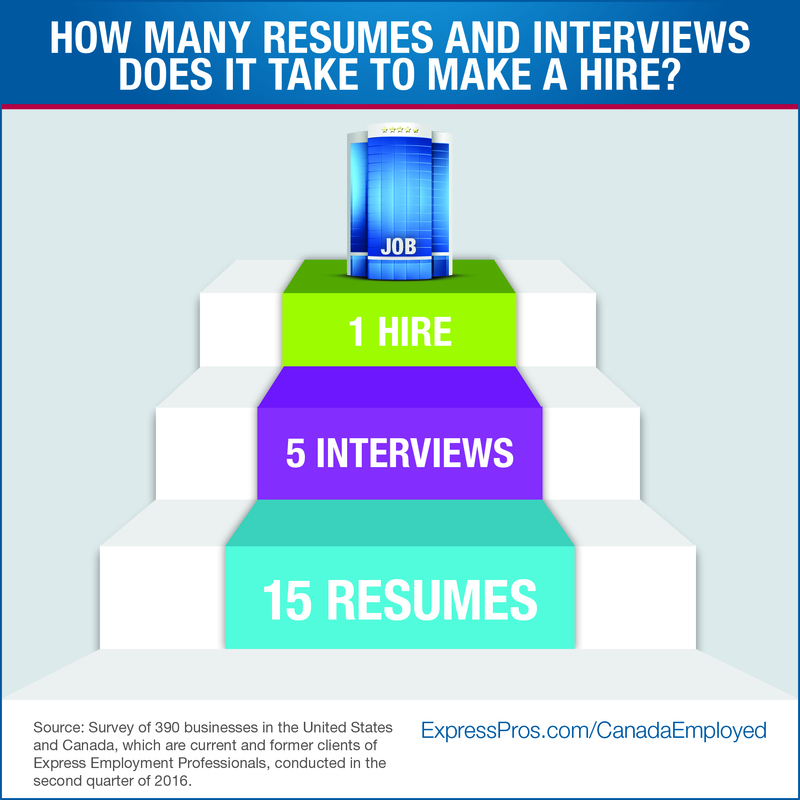 How Many Resumes Does it Take to Make a Hire? 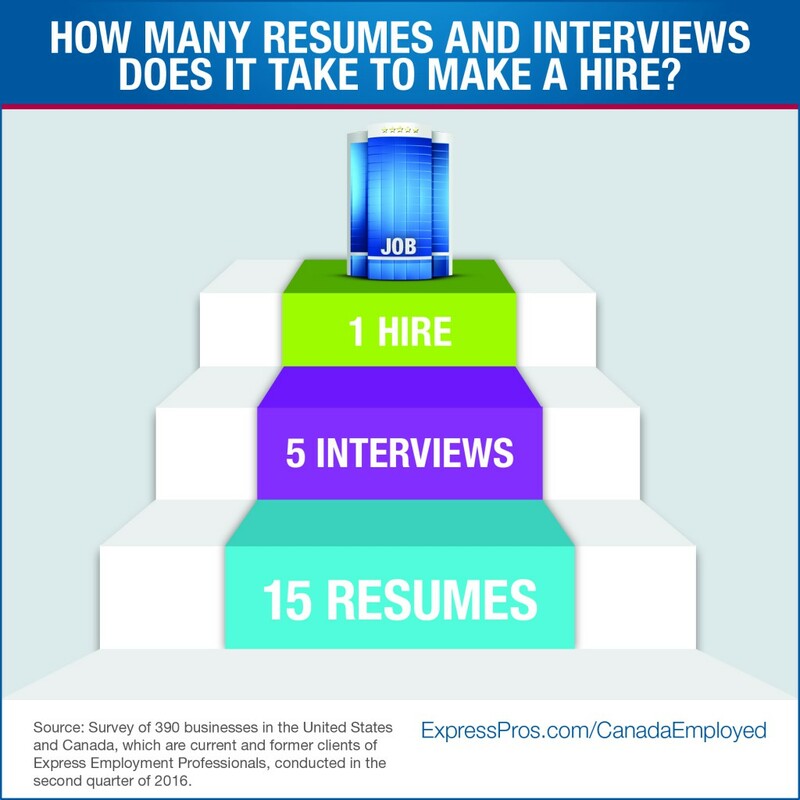 Express Employment Professionals recently asked 390 businesses in the United States and Canada how many resumes and interviews does it take for employers to fill one job. The results may surprise you as businesses spend more time than you think to make one hire. Depending on the industry, business leaders report that candidate searches can involve reviewing as many as 16 resumes and up to five interviews. Finding the right person for the job is an important task, and businesses say they go through an intensive search process. Even for general labor jobs, businesses say they review up to 15 resumes and conduct four interviews. This increases for administrative and professional roles, and does not include drafting and placing advertisements for job openings, recruiting, conducting reference checks, and any required testing or other screening. The job search is competitive, and there are several ways you can stand out from the competition. Movin’ On Up has numerous articles that can help you with your resume. One of the most popular resume articles takes a look at the chronological resume versus the functional resume. You have roughly 10 seconds to grab the attention of a hiring manager and knowing the advantages of these types of resumes can go a long way in helping you land an interview. You’ve passed up some of the competition and made it to the next step. However, when you’re in the interview process, make sure you dress the part for the job you want and ask thought-provoking questions. Plus, remember to follow up by writing your interviewer a thank-you note. Employers often struggle with finding the right person for the job and culture. There are soft skills that hiring managers often look for such as communication, teamwork, and time management. Soft skills are vital to helping you fit in with the company culture and working with others. Here are 10 actions you can take to help develop your soft skills as you enter the workforce. If you’ve recently made it to the top of a hiring manager’s list, tell us how you approached your job search that helped you stand out from the competition in the comments section below.